I'm planning a research to trip to Princeton this summer (I know, who doesn't want to go to New Jersey in June?!?) and flying into Philadelphia, so I was trying to figure out if there was anything I needed to look at in Philly in my few hours there. The Cemetery Returns were indexed by the W.P.A. and have been microfilmed by the Genealogical Society of Utah. All death registers from 1860 - 1903 are available on microfilm. The Genealogical Society of Utah finished microfilming all actual death returns 1860 - 1915 in 1997. Beginning February 13, 2012, original birth certificates for 1906 and death certificates for 1906-1961 will be available at the State Archives... An index will be available on the website of the Division of Vital Records as well as in the Archives research room... Copies of these birth and death certificates may be requested by mail using the Mail Reference Order Form. If the name of the person and the date of birth or death are known, the fee is $15.00 per name for requests from Pennsylvania residents, $25.00 per name for requests from outside Pennsylvania. The birth or death certificate number also will be useful in research. The research charge is $50.00 per name per hour if only the name is provided. In the Trenton Evening Times on Sept. 21, 1915, a report that Irene was dying in a Philadelphia hospital, "The poison of the tattoo marks she had worn all over her body from the age of 8 years began its deadly work." Billboard picks it up on Oct. 2, 1915: "TATTOOED WOMEN DYING... Mrs. Irene Woodward, famous tattooed women, is at the local hospital, dying of what physicians say is cancer of the stomach. An operation, it is said, would be futile. She is fifty-seven years old." Then in Dec., 1915, three articles stating that she had died. So, she gets sick in Sept., dies in Dec., right? Imagine my surprise when I see an entry in the death records index for Irene Woodward with a death date of Oct. 9, 1915. So, I immediately send away for a copy of her death record, and then I then plug this date into Ancestry, and I get a hit on a record for her death and burial from Historic Pennsylvania Church and Town Records, records from Monument Cemetery in Philly. She died Oct. 9, 1915, and was buried Oct. 15, 1915, and now I have her age at death (58), her last known address, and a reference to her being Mrs. Chas Smith, as well as the lot, section, and grave number, as well as the price and size/shape of her coffin. When I got the death certificate in the mail, it confirms all this, plus more (includes her parents' names), mentioning that she entered the hospital early in Sept., and died of uterine cancer. Her hospital stay was brief, only 25 days. Hopefully for Irene, it was 25 days of morphine-induced peace, because I can't imagine how awful dying of uterine cancer was in 1915. So now, I have all this great information, and potentially a place to visit in Philly, Irene's grave in Monument Cemetery. Great, right? I look up Monument Cemetery, and what I find induces rage and tears. The first hit is a eloquent post by The Cemetery Traveler called The Watery Remains of Monument Cemetery. I learn that Monument Cemetery is no longer. I can't visit Irene's last resting place because in the 1950s, Temple University acquired the cemetery and turned it into a parking lot. About 300 individual graves were relocated to Lawnview Cemetery in Rockledge after a feeble attempt by the owners of the cemetery to contact relatives of the 28,000 people buried there, the rest were removed and placed in a mass grave at Lawnview. 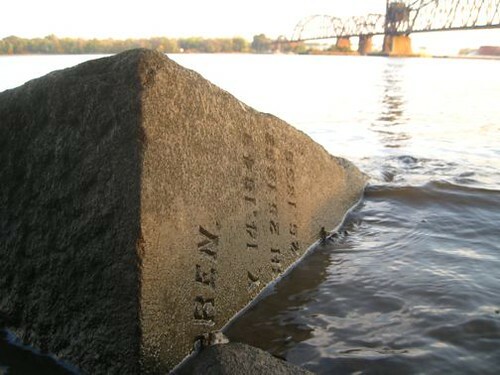 The headstones were scrapped and used to build the base of the Betsy Ross Bridge over the Delaware River. Many headstones are visible from the shore of the river. Again, Cemetery Traveler gives some great insight in a second post, How Monument Cemetery Was Destroyed. In short, it was the 1950s, this was an aging Victorian cemetery in a prime location, and not enough people cared. The 1950s was famous for its sense of "progress," i.e., let's wipe out the old musty Victorian past. This could never happen today. I'm not sure if I'll be able to make it Lawnview to see Irene's final final resting spot, along with all the other unclaimed folks from Monument, but I will try. If anyone is wandering by the shores of the Delaware and happens to see her headstone, I'd love a picture. Perhaps that's why I feel so connected to her, but I'm still left with sadness that an entire cemetery was destroyed to make a parking lot, and the graves were handled so callously. Whatever you feel about the usefulness of cemeteries, they are still places of peace where we commemorate our dead, and they should be treated with respect and care. The Muslim Bonaparte, Please. someone, somewhere... has a copy of Katherine E. Fleming's 1999 book The Muslim Bonaparte: Diplomacy and Orientalism in Ali Pasha's Greece for less than $100. (Some copies are $500.) I don't care what kind of condition it's in. Seriously. Help? ?